The books–all ten of them–are hardcover, and red, and small enough that they could easily slip into a coat pocket to read on the…well, where would you have read a short story in 1927? Only about 21% of Americans owned a car then, so it’s possible you read a short story on the streetcar to work. Maybe you read on your lunch break, or at home. Maybe you just had the books for show, like Gatsby; they certainly look nice enough on a shelf. I know they look nice enough on a shelf, because they’re on our shelves at home, the nice shelves with the antique books, my wife’s grandmother’s collection. Books like these are meant to be regarded and never read, like the ones lining the HEMNES bookshelf at IKEA or the books-by-the-foot sales that set decorators use to give a room some atmosphere. But what if someone did read these? Would we understand something more about 1927? About fiction? About Western culture? Would we make it through all one hundred, or would we burn out from repetition and the datedness of what was fresh 88 years ago? 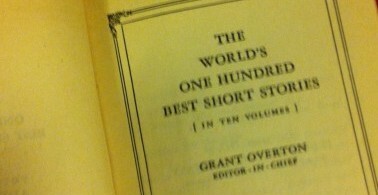 Ten volumes, small red books with ten short stories each. Some of the authors I recognize (Emile Zola, Booth Tarkington), but there are plenty I don’t (Prosper Merrimee?). The volumes are divided into ten different themes, so we’ll start next week with the first story in Volume I: Adventure, “The Two-Gun Man,” by Stewart Edward White, which–let’s be honest–sounds like the kind of fantastic, pulp-y story that we just don’t get these days.